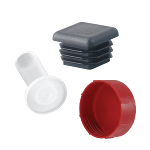 Although most of MOCAP's stock standard plastic caps and plugs are made from Low Density Polyethylene (LDPE), our capabilities include Plastic Injection Moulding of Polypropylene (PP), High Density Polyethylene (HDPE), Nylon, Thermoplastic Elastomers (TPE) and virtually any thermoplastic resin. 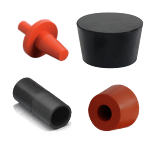 Our families of standard Rubber Products are based on moulded and extruded Silicone and EPDM materials, but our capabilities in manufacturing rubber products includes molding a wide range of thermoset rubber materials including EPDM, Natural, Neoprene, Nitrile, SBR, and Silicone. 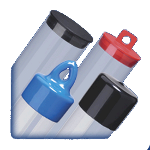 We Offer a wide variety of caps, plugs and grips made from flexible Vinyl (PVC) Plastic. 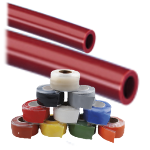 We stock numerous vinyl PVC materials most commonly used to make flexible vinyl caps, plugs, grips and masking products. 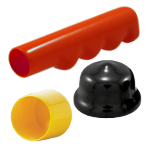 If your product or project requires a custom dip-moulded part in a special colour, hardness or texture, we can deliver. MOCAP's capabilities are second-to-none. Our paper caps and plugs including Straight Caps and Tapered Plugs are produced using tough, but flexible natural paper. 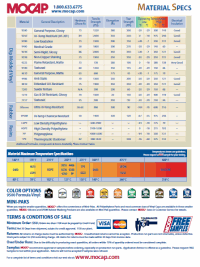 The paper is environmentally friendly, recyclable and can handle temperatures up to 204°C (400°F) .